Description: Striking chart of the Balearics featuring all three islands, Mallorca, Minorca and Ibiza, embellished with ships and sea monsters. Based on an earlier chart published by the Blaeu family. Description: Mallorca, Minorca, Ibiza and Formentera, here called the Pytiusae Islands. A beautiful chart of the Balearics featuring Latin text on verso. Original hand-colour. Description: Mallorca. Small, early depiction surrounded by panels of text. Compass roses and ribbon cartouche. Description: Ibiza, Mallorca and Minorca, with the coastline from Valencia to Provence. Copper-engraved sea chart with decorative cartouche. Black and white. Dutch text. Title: : Insulae Balearides et Pytivsae. Description: The Balearics. Decorative map of the Western Mediterranean showing Ibiza, Formentera, Majorca and Minorca. Original Colour. Description: Magnificent chart of the Balearics with insets of Mahon and the Bay of Sofa. Also shows the Eastern coast of Spain. Description: Impressive large map of the Balearic Islands of Majorca, Minorca and Ibiza and Formentera. French text descriptions. Original Colour. 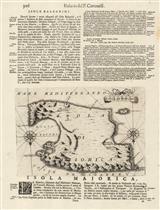 Description: Mallorca, Menorca, Ibiza and Formentera, with inset maps of the port of Mahon and the Eastern Mediterranean. Beautiful map in rich original colour. Description: Minorca. Mahon. Plan of the town and harbour. Coloured. Description: The Balearics. Stunning chart of the islands of Majorca, Minorca and Ibiza. Inset of Port Mahon. Description: This mid-18th century map of Minorca separates the island into its various "Terminos" or regions. A pictorial cartouche is present on the lower left and the engraver is Thomas Kitchin. Coloured. Description: Charming small map of the Harbour of Mahon with a detailed plan of St. Philip's Castle, the fortress at the entrance of the approach to the Harbour. Coloured. Description: Late 18th century map of the Balearic Islands based on a marine survey by Jacques Nicholas Bellin. Insets show Mahon and the overall position of the islands in relation to the Iberian Peninsula. Original hand colour.